You might recall this alluring. 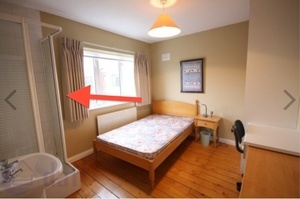 compact bedsit/corridor (above) we featured recently. 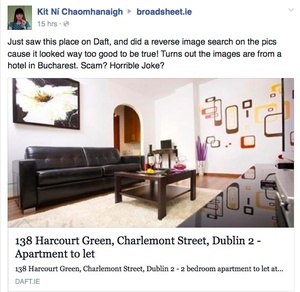 Posted in Misc and tagged Crying Chair, Daft at 4:34 pm on August 11, 2014 by Broadsheet. If they know the right people I’d say it definitely is. It might be possible. All depends on what “falls under regulation” means. “They say” ,do they?? What the hell do you think? Did you ring them about renting it or just being a nosy fupp ? How the hell can they get a way with charging that amount of money for it? My only real problem with it is the price. If it was cheap, it’d be fine for a while. Please stop saying “Anyone?”, please. PLEASE STOP REPEATING YOURSELVES. PLEASE. “Anyone for you”… oh wait. 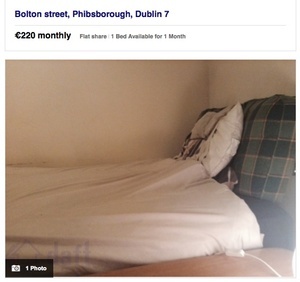 That looks like a normal student bedsit we’d have in France. A bit narrower maybe, but I don’t find it shocking. The price, however, is ridiculously high. 2) A separate room, for the exclusive use of each rented unit, with a toilet, a washbasin and a fixed bath or shower with hot and cold water – yip there’s a bathroom at the end of the unit. 3) A fixed heating appliance in each room, which is capable of providing effective heating and which the tenant can control – can’t see it, but easy enough to stick in. The word effective might be problematic. 4) Facilities for cooking and for the hygienic storage of food, for example, a 4-ring hob with oven and grill, fridge-freezer and microwave oven – 4 ring hob &, an oven & a fridge – tick box. When the standards are that low, it’s not difficult to meet them. And yet a third of places checked by the council so far have failed them. Which is quite shocking. what is going on with property in this country, just as corrupt and bizarre, nonsensical but totally accepted? That’s a bit of a generalisation. It takes two to tango, not the whole country. Kind of odd that the rental standards accepted should be so different, considering that when you are looking for a loan to *buy* a place, they’re very sticky about having a lobby between the toilet and the kitchen. 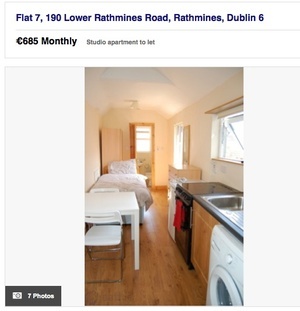 If this country wanted to learn anything from the bubble we would have immediatly overhauled and introduced proper rental standards and requirements including proper long term renting arrangements that are the norm in most of Europe. The fact that this was never mouted anytime here in the last 6 years tells you all you need to know about what the vested interests in this country want. A return to the “good times” -Of buying overpriced shitholes. If it was checked with the “health board”, even allowing for them to actually mean the HSE, that means it was many, many years ago. Hasn’t been their responsibility for donkeys years. Unfortunately the push for abolition of bedsits has lead to the huge hikes in rent we have seen recently. SWEET HOLY JESUS SAVE US ALL FROM THE BEDSIT!!! !